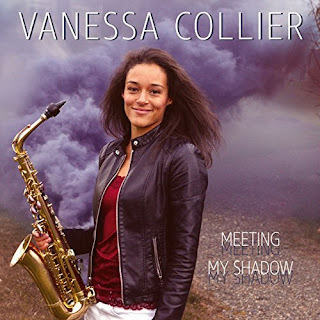 I just had the opportunity to review the most recent release, Meeting My Shadow by Vanessa Collier and it's quite good! Opening with dark, slinky, Poisoned The Well, Vanessa Collier has a great sound as a lead vocalist and her clavinet work on this track and especially her haunting flute work on track one is intoxicating. I really like the bass line by Lenny Bradford and Nicholas Stevens' drum work. Excellent opener. On R&B track, Dig A Little Deeper, Laura Chavez created a cool traditional guitar rhythm and Collier adds her solo sax work to the horn work of Marc Franklin on trumpet giving the track a bit more punch. When It Don't Come Easy has a smooth southern blues rock featuring Chavez on electric guitar and resonator guitar and getting some of the best vocal warmth from Collier. Rock n roller, Two Parts Sugar, One Part Lime features a bit more of Collier's solo sax work with her vocals and some nice piano work by Charles Hodges. Soul track, You're Gonna Make Me Cry has some particularly expressive vocals by Collier and a bluesy guitar solo by Chavez making it one of my favorites on the release. With just a dash of New Orleans, Meet Me Where I'm At, has a cool funky feel, nicely blended vocals and super sax and trumpet work pined against a snappy percussion/ piano bottom. Very cool. With it's Tower of Power like roots, Cry Out has a great feel with Franklin and Collier funking it up over nice Chavez's guitar rhythm and super vocals. Very nice. Revival/gospel styling on Up Above My Head I Hear Music In The Air is a real rebel rouser with great keys, a slick, Boots Randolph sax vibe and a swinging soul conclusion. Wrapping the release is a really nice ballad, Devil's On The Downslide, again reinforcing the strength of Collier as a straight up vocalist. With perfect organ work by Hodges, cleanly detailed guitar work by Chavez and Daniel McKee on bass this track is a perfect closer for a really nice release.